How To Use PayPal: Please contact us for a booking time & date and then make the reservation payment of $100 by clicking the secure PayPal link below. 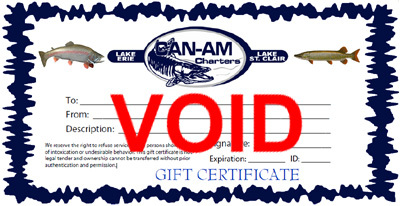 You can also pay for your charter in full or buy gift certificates by selecting an option from the drop-down menu box. If you have a PayPal account, then log in. If you don't have a PayPal account, click the Continue Button on the lower right. Licenses can be purchased on-line or any bait shop. Please contact us about gift certificates. They are a great gift for birthdays, retirements, Fathers Day, anniversaries and Christmas. We reserve the right to refuse service to any persons showing signs of intoxication or undesirable behavior. This gift certificate is not legal tender and ownership cannot be transferred without prior authentication and permission.